Exploring Restorative Justice Practices as a Compelling Response to the Challenges of an Aging Population! 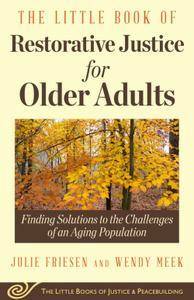 As our global population ages, conflicts and difficult conversations emerge. How will older adults decide who will make end-of-life health and financial decisions for them? When will dad need to move out of his home and into long-term care? We can’t have mom living with us anymore because it’s just too hard. Why are my children fighting over where I will live? Why is my son taking money from me? These are challenging scenarios that ever-increasing numbers of people are facing. Certainly, there are some reasons to worry; however, the challenges facing older adults can be an opportunity for positive change. The Little Book of Restorative Justice for Older Adults is about providing safe and respectful processes to assist in resolving conflict and addressing abuse involving older adults, families, caregivers, and communities. Authors Julie Friesen and Wendy Meek explore ideas to help connect and support people, building on the strengths and capacities of older adults and their families, in order to strengthen communities. Restorative justice dialogues help older adults and their families talk constructively and safely to find ways to move forward together.